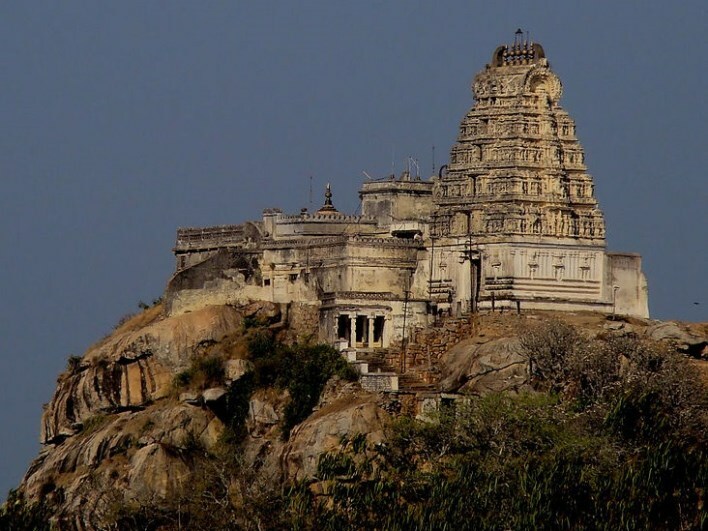 Yoga Narasimha Temple at Melukote is one of the prime attractions of this Hindu religious spot. Situated under the Pandavpura Taluk in the Mandya district of Karnataka, the impressive temple stands on top of a hill at a height of 1777 metres above the sea level. The historic temple attracts devotees due to its architectural beauty, serene surroundings and religious significance. The majestic temple is dedicated to the Hindu deity, Narasimha. The temple houses an idol of Narasimha in a seated position with the Yogapatta. The temple is considered to be one of the seven holy centres devoted to the worship of Narasimha. Apart from the regular pujas carried out on a daily basis, the temple holds special pujas to celebrate the Narasimha Jayanthi festival every year. The history of the temple dates back to the ancient times. The temple was built during the Hoysala kingdom. The beauty and religious significance of the temple has always fascinated the common people and the royalty alike. The temple has a huge drum that was donated by Tipu Sultan. It has a beautiful bell that was donated by the Mysore Parakalamatha. During the rule of the erstwhile Wodeyar Kings of Mysore, Krishnaraja Wodeyar III had donated a gold crown to the temple deity. The temple boasts of an impressive architecture. There are around 300 steps that lead to the temple situated high up on the hill. The intricate carvings on the pillars and the overall structure of the temple offer a glimpse into the architectural style of the bygone era. The top of the temple is visible from afar due to its height but the full glory of the detailed work of the craftsmen is visible only when one reaches near the entrance. The temple has numerous legends associated with it. One of the most famous beliefs about the temple is that the idol of the deity Narasimha was installed by Prahalada, son of Hiranyakashapu himself. It is also believed that the temple finds reference in the Vedic literature that dates back to thousands of years. The temple has a routine for daily worships. Regular worship of the temple deity takes place from 9.00 am to 10.00 am every morning. From 10.00 am to 11.00 am ‘abhisheka’ of the idol is carried out. People are allowed for darshan of the deity from 11.00 am to 1.00 pm. The devotees are allowed a darshan in the evening hours from 5.30 pm to 8.00 pm. The temple has extended timings of darshan during the weekends and public holidays. On every Saturday, Sunday and public holiday darshan is allowed from 11.00 am to 2.00 pm during the morning hours and from 5.00 pm to 8.00 pm during the evenings. The temple strictly prohibits any kind of photographing inside the temple premises. But visitors can keep their cameras with them while they are inside the temple. The temple can be reached from the base of the hill by climbing up the steps or by riding on light motor vehicles. Melukote being a famous place for its numerous temples, it is easily accessible by several means of transport. Melukote is located at a distance of 51 km from Mysore and 133 km from Bangalore. The nearest railway station is at Mandya. The nearest airport is the Mysore airport that has flights connecting it to only Bangalore.